While you prep up to check out Monisha Gidwani's Vimonisha exhibition in Chennai this August, we suggest you take a look at the top labels showcasing just for you ladies. Going-to-be-married or attending-a-wedding, this is the perfect place to shop. Traditional, contemporary and modern, Vimonisha has lots in store for each one of you. Born in Mumbai, India in 2007, KALKI evokes the very spirit of the city it was founded in. An upstart, innovative, and dynamic brand – KALKI – offers the best of contemporary, ethnic Indian fashion and fusion-wear styles. 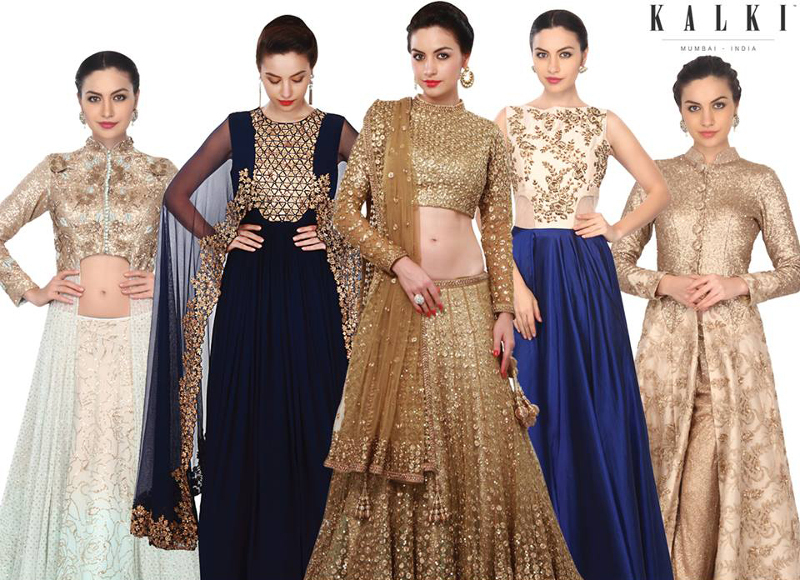 KALKI’s couture and prêt lines feature ensembles that showcase innovative fabrics, prints, and colors. Modern silhouettes, cuts, drapes, and embellishments transform these into the season's trendiest must-haves and timeless couture. A distinct range of contemporary Indian wear and Fusion wear styles finds favour with the globetrotting, modern Indian fashionista. N&S GAIA by Sidharth Sinha is committed to using natural fibers to produce sustainable and essential fabrics for garments and paying tribute to the environment for desirable clienteles. While being in constant touch with their roots, the brand is driven towards western sensibilities and committed to research and development in the areas of Natural Dyeing and Crafts of North East India. This collection is dedicated to the weavers and craftsmen of the state of Meghalaya. The Brand N&S GAIA means Nature & Sustainability with revered guidance of Mother Nature, inceptor and creator – GAIA, the primal Greek Goddess. N&S GAIA was launched with the support of the Department of Handlooms, Government of Meghalaya at Lakme Fashion Week Summer Resort 2014, and has continued showcasing at LFW Winter Fest 2014. The brand has been nominated for 2015 International Woolmark Prize most recently. "WeaverStory" is an online store for Authentic Indian Handlooms/crafts - Sarees, Dupattas, Fabrics, Handicrafts. Each product is hand picked and curated. What started as a small experiment in sourcing directly from weavers across India for our own consumption, has now transformed into an exciting collection of products that they now offer to their customers at very genuine prices. While traveling the handloom clusters of India, the idea is to bring the best of the craftsmanship to the world, and help the struggling craftsmen with a window to showcase their best products and help them Weave-a-Story. The team focuses on quality, authenticity and right pricing while the experts hand-pick the best for the brand's customers.